Read this entirely BEFORE beginning to pack the Top 80. The final shipping weight of the Top 80 will be 55-65 lbs. Make sure you do not exceed 70 lbs. Shipping the paramotor as luggage on an airline has always been hit or miss. Will they accept it? It so depends on the airline and, especially, the airport you are flying out of/in to. Foreign and northeastern airports (Logan Airport, in particular) tend to be harsh on travelers with nit-picky officials looking for excuses to foul up your plans. Always be prepared to ship it via FEDEX or UPS. Make up shipping labels for the “just in case.” Just because they let you check it one way does not mean you can check it the other way back. I have been bit by that piece of incongruousness. Supplies needed: a.) 19″ x 19″ x 40″ heavy duty corrugated cardboard container. Bigger boxes may not be accepted by either the airlines or commercial shippers as non-freight (UPS or FEDEX). The size specified here is the minimum that will work. b.) About 2 sq. ft. of 1 1/2″ thick hard foam packing material c.) Soft foam to plug the spark plug hole and exhaust port d.) HD plastic bags, bubble wrap, and packing tape e.) Empty plastic water bottles with the caps on — they are a great packing material to fill up empty space in the box. f.) Be sure to have “blue” Locktite on hand when reassembling the muffler attachment bolts. 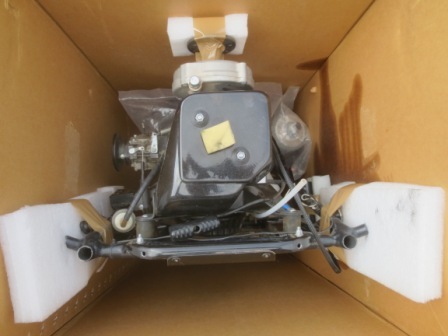 There must be no traces of fuel in your packed Top 80 if you plan to ship it on a commercial airline. If fuel vapors are present or detected in your shipping container, you could get in BIG trouble. Steps: 1. 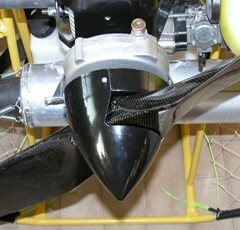 Disassemble the Top 80 — Remove: the harness from the frame but leave the arms attached, the netting and all sticks/rods, the muffler, the airbox, the propeller (if it is a single piece, it will have to be shipped separately), the fuel tank cap and the cap with the fuel suction line, and the tank. Detach the fuel line from both the carburetor and the quick release fitting. Remove the spark plug. 2. Removing fuel from the system — To remove fuel from engine parts, compressed air is the best way to do it. A hair dryer also works for the fuel tank. “Baking” the carburetor in an oven at about 200 degrees overnight will also get every trace of fuel out of it. Putting the fuel tank in the hot sun for an afternoon will do the job. A rule that the airlines may enforce is “anything other than new which has had fuel in it cannot go as luggage.” This means the carburetor and the fuel tank including the lines. Because of a recent adventure of a pilot who had his engine confiscated, I recommend that these be removed and shipped separately. They are lightweight and you will avoid being hassled, fined, etc. 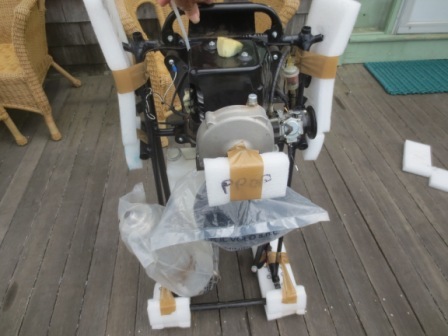 Even better, ship just the entire engine sans muffler separately via FEDEX/UPS. 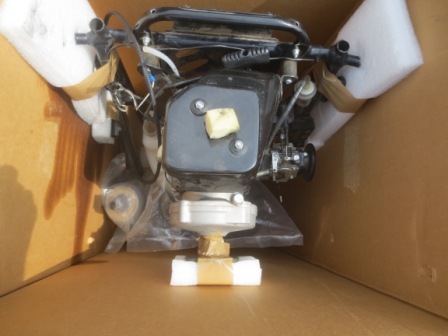 Shipping the carburetor, fuel lines, and fuel tank via 2nd day air is not too expensive. ALWAYS GET TO THE AIRPORT (2) HOURS OR MORE AHEAD OF TIME IN CASE YOU HAVE PROBLEMS. Most airports have a FEDEX or UPS facility close by so you can ship your paramotor if you have to. 3. Stuff small pieces of soft foam into the spark hole and the exhaust port to prevent foreign objects from accidentally getting in like a nut or bolt. 4. Use the stiff foam to pad the Top 80. 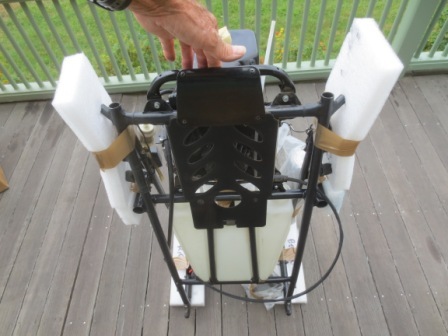 The weight of the paramotor is the engine and all packing must be carefully attached to the area around the engine, to the bottom of the frame, and the top of the engine. Re-attach the fuel tank but not the fuel lines — be certain the fuel caps are not on the tank! The wrapped muffler fits nicely along the side of the motor per the photo. The airbox fits well just above the fuel tank. Wrap the harness in a HD plastic bag and slide it down the front all the way to the bottom. Watch out for the throttle cable. Place the wrapped netting hardware in a corner of the box diagonally. 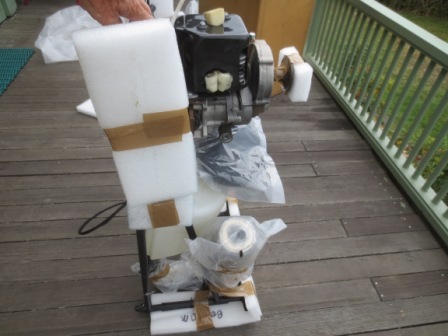 You must add packing material between the top of the motor and the top of the box. THE PARAMOTOR CANNOT MOVE WHEN IN THE BOX. A two piece propeller fits nicely in the box but not a single blade type which will have to be shipped separately. Look at the following photos carefully for tips on how to place the stiff foam material. Be sure to LABEL the foam pieces for next time. 5. 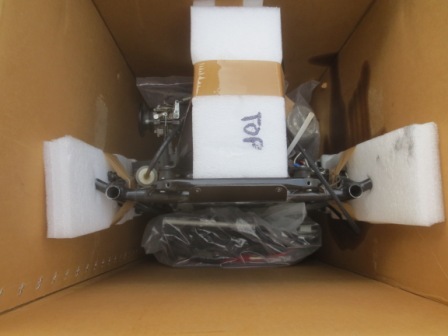 Be sure to put the labels on the side of the box that has the harness side of the Top 80. Do not put the labels on the top/bottom of the box. 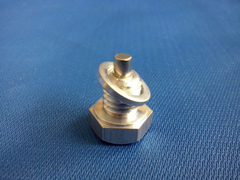 If you do it correctly, you will not have to drain the gearbox oil. If, somehow, the box is stored prop side up or upside down — you may have a small mess. You might want to wrap the gear box with an old towel, just in case.